We all know that family in town who seems to have it all figured out. They go running together (sometimes in matching sweatsuits), take vacations hiking the mountains together, and shop for organic produce together. A little bit of genetics and a lot of good habits go a long way when it comes to staying healthy with your family. It’s common sense that healthy eating and exercise stabilizes your energy level, sharpens your mind, increases your confidence, and decreases your risk of disease. But what if you’re part of a family that prefers cupcakes to carrots and reality TV to running? It can be difficult to change your diet and lifestyle once you become comfortable with household routines, especially if you don’t feel supported by your loved ones. Conversations about change can become heated, emotional, and downright offensive. Healthy diet and exercise take on a different definition for each individual and each family. It’s time to stop squeezing in a healthy habit here and there, but rather make them so commonplace that they become effortless. 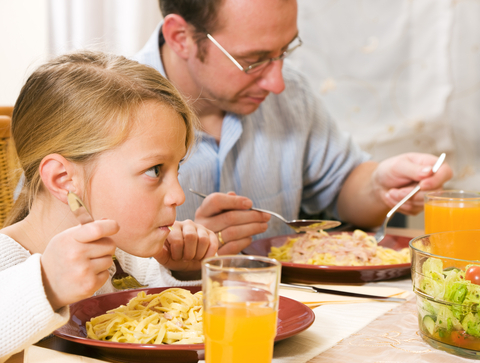 Regular, sit-down family meals that get everyone involved is a great place to start. Ditch outdated methods of using food as rewards, and stop insisting that everyone clean the plate before leaving the table. Get creative with your dinner menu and let your family choose themes for your food to revolve around. Search for some recipes and devote your Tuesday nights to Indian cuisine. Make a list of foods that are naturally orange and create a meal that revolves around that color. Keep the adventurous spirit alive at dinner time and no one will get bored. If your family is prone to unhealthy snacking, simply stop stocking your cupboards with unhealthy snacks. If you don’t see them, chances are you won’t crave them. As you know, children have a strong impulse to imitate so you must be their healthy role model, even when you don’t think they’re watching. Many people think of exercise as task that they’re supposed to squeeze into an hour a day, three times a week. As long as you keep thinking of exercise as a chore, it will feel like one. If you don’t like running, don’t run. Given the hundreds of ways to exercise, it’s impossible to not find one you actually enjoy. To get started, go for walks around the neighborhood after dinner. Instead of springing for a family gym membership that never gets used, head to the backyard or the neighborhood park in the evenings to toss a football around, play a game of disc golf, or shoot some hoops. What most American families need is less lecturing and more playing. Diet and exercise aren’t meant to be a chore, and they actually can facilitate family bonding. It just takes one family member to get the ball rolling towards a healthier future for everyone in the house. All you need is a little motivation, a little planning, and a whole lot of love. For more ideas about themed family dinner nights check out She Knows Parenting, and browse through Active magazine’s suggestions for family-friendly outdoor activities.